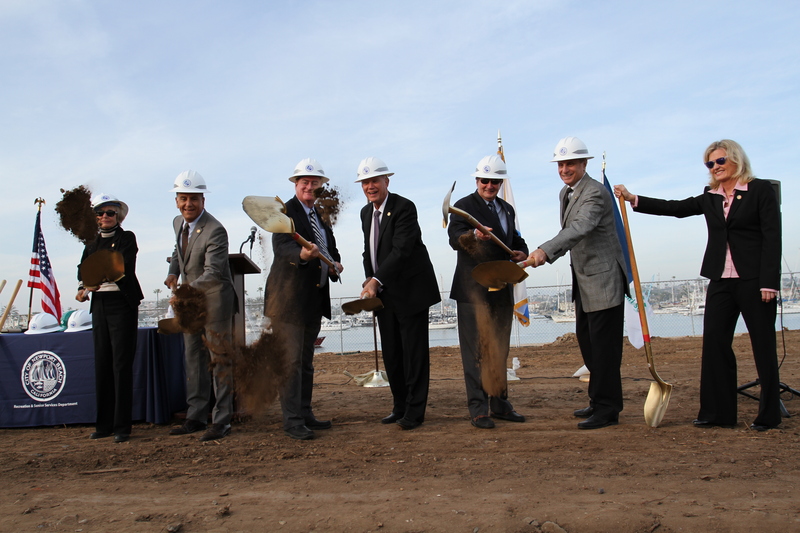 Newport Beach City Council members helped commemorate the ground breaking of the long-planned Marina Park project. Mayor Rush Hill provided remarks during the special ceremony held Tuesday, Feb. 11 near 18th Street and Balboa Boulevard. Councilmembers Nancy Gardner, Tony Petros, Keith Curry, Mayor Rush Hill, Ed Selich, Mike Henn and Leslie Daigle help shovel some dirt on the site of the 10.5 acre park. Marina Park will include a public park, a 24,000 square-foot community and sailing center building; a 23-slip marina with 21 slips for boats up to 40 feet in length and two slips for boats up to 57 feet in length. A 200-foot side-tie area is planned to be used as a public transient vessel dock, accommodating recreational vessels and sailing center boats. It is scheduled for completion in spring 2016.